I recently saw the movie Julie & Julia and can I just say I loved it! I wanted to pack up all my belongings, move to France, and become a chef. At the moment, that probably isn’t the best move for me, so instead I got a few of Julia Child’s books out of the library, including her behemoth The Way to Cook and signed myself up for a knife skills class. 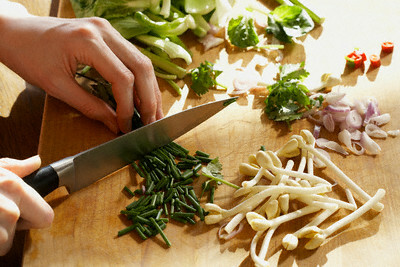 While anyone can follow a recipe, it is much harder to learn how to wield the tools without instruction. And then of course there will be lots and lots of practice. The scene that comes to my mind is Julia standing next to a huge pile of freshly chopped onions. Unfortunately all the knife skills classes are full until March (welcome to NYC) but in the meantime M&I will be attending a hands on cooking class for Valentine’s Day. On the menu? Oysters Mignonette, Filet Mignon with Wild Mushroom Cognac Sauce, Haricots Verts, Pommes Anna & Chocolate Soufflé. Yum yum. I will take an experience with my sweetie over sweets any day. That sounds like a delicious Valentine’s cooking class (in more ways than one)! I need to see that movie – I wanted to read the book first, but I took it with us over the holidays, didn’t get very far, and then had to return it to the library. Maybe it is time to start my netflix account back up.